As a world-renowned writer and social commentator, I’ve often stated that there are some notable differences between men and women. Thus far, no one has come forward to prove me wrong. Nor, frankly, has anyone thanked me for this observation, though I shudder to imagine what the world would be like if I hadn’t pointed it out. Woman: I ache all over, my stomach is queasy, I’m coughing and hacking. It was a struggle to get out of bed feeling so awful. Woman: OK. I called the office and told them I’d be working from home today. Took advantage of the situation to start a load of laundry. Finished the dishes. I hope I can manage a nap this afternoon. I feel rotten. Got started on e-mail. Man: Made it to the couch. Woman: My mother called my office, and they told her I was home sick, so naturally she phoned me, all worried. It took me 15 minutes to get her calmed down and to convince her I didn’t need her to rush over here and take care of me. Man: I called my mom to ask her to rush over here and take care of me. Woman: I hate taking cold medicine because it makes me light-headed, but I feel so awful I broke down and took a pill. Hope it helps. Man: I can’t believe I’m out of beer. Woman: While working on this report, I jumped over to the Web to investigate my symptoms. Looks like this is just a bad case of the flu. Even if I feel better later on, I’d better not go in — I wouldn’t want anyone else to catch this. I told the office it looks like I won’t be contagious after today, so I’ll be in tomorrow — we need to be prepared for our client meeting on Friday. Man: While looking at this year’s bikini calendar on the Web, I decided to investigate my symptoms. Looks like I have Ebola. I called the office and told them I’d be out the rest of the week. Wish my mom would hurry up and get here. Woman: So nice how everyone has been sending me get-well e-mails. I’ve told them not to worry, it’s just the flu, no big deal. I’m hardly the only person to come down with the flu this season! 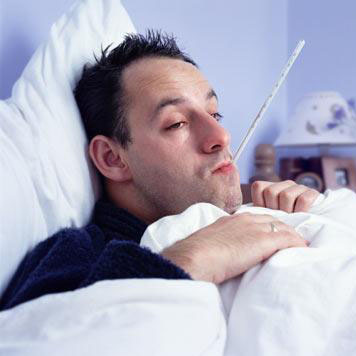 Man: No one has ever been this sick in the history of the world. Woman: I completed the report, had a conference call with a client, finished the laundry, vacuumed the apartment and balanced the checkbook. Man: I must be feeling a little better — I was able to use the TV remote. Woman: It turns out two other people in my department have the same thing! We’re e-mailing each other encouragement — though this one guy hasn’t answered. Hope he’s OK.
Man: Why me? Why, of all the people on this planet, do I have to be the one to suffer with this dread disease? Even worse, I’m getting these cheerful e-mails from two women in my department who claim to have the same thing, whereas the fact that they can send e-mails proves they aren’t as sick as I am. I couldn’t type to save my life. Woman: In some ways, this has been a blessing — because no one is interrupting me, I was able to concentrate on our client presentation for this weekend and found a number of errors I probably wouldn’t have caught otherwise. I guess it just proves there’s always a silver lining if you look hard enough for it. Man: I don’t know what I did to deserve this. My mom finally got here — now she’s running around cleaning the apartment, doing laundry, making all kinds of racket so that I can barely sleep. I guess it just proves you should always be careful what you wish for.